Bentley recalls 7539 UK cars | What Car? Bentley is recalling around 7500 Flying Spur, Continental GT, GTC and GT Speed cars in the UK after discovering a potential problem with the fuel filter. 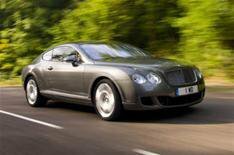 In total, 33,155 Bentleys are being recalled worldwide, with 7539 in the UK. The recall only affects models built between December 2003 and March 2008. A Bentley spokesman said it has discovered that around 30 cars globally have developed fuel-filter corrosion, but that Bentley took the decision to issue the recall as a precautionary measure. The fitting of a replacement part will be carried out free of charge and take about an hour.